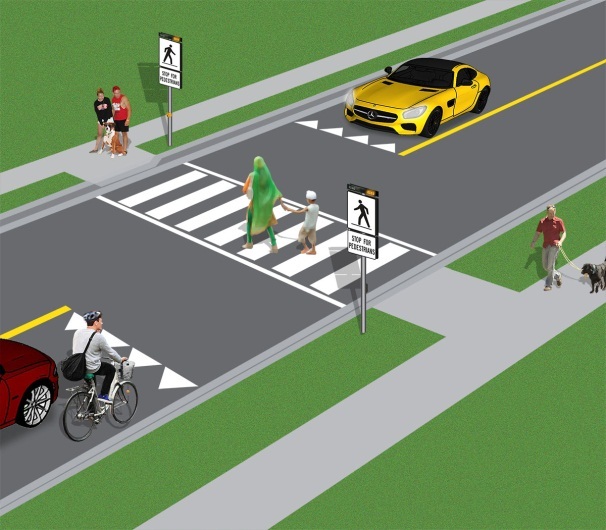 As of January 1, 2016, drivers - including cyclists - must stop and yield the whole roadway at pedestrian crossovers, school crossings and other locations where there is a crossing guard. These new rules do not apply to pedestrian crosswalks at intersections with stop signs or traffic signals, unless a school crossing guard is present. Only when pedestrians and school crossing guards have crossed and are safely on the sidewalk can drivers and cyclists proceed. 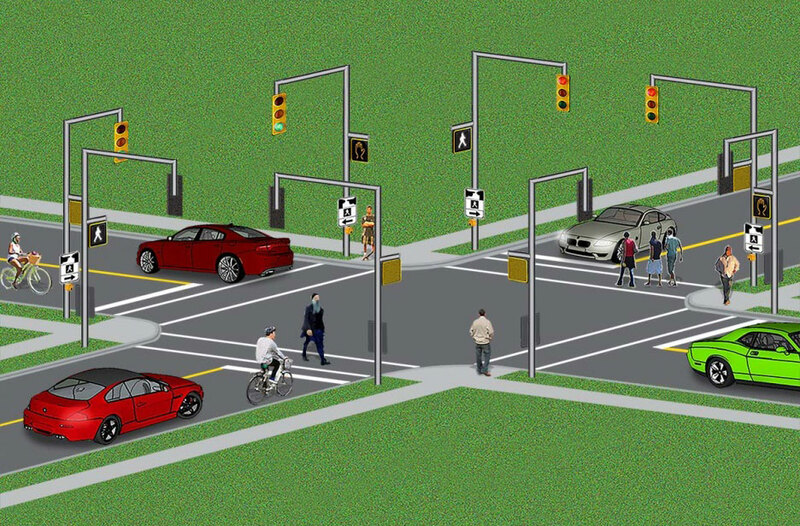 There are four types of pedestrian crossovers in Ontario. Three of them are new designs. See Q9 below. It is up to both drivers and pedestrians to keep everyone safe on Ontario roads. Learn more about how to stay safe as a pedestrian and as a driver. Drive carefully near streetcar stops with islands or zones for passengers getting on and off. Pass them at reasonable speeds, and always be ready in case pedestrians make sudden or unexpected moves. Drivers will be fined $150 to $500 and 3 demerit points for offences at pedestrian crossings, school crossings and at crosswalks where there are traffic signals. The maximum fine for running a red light - a practice that puts pedestrians at risk - is $200 to $1000. Fines are doubled in Community Safety Zones, near schools and public areas. These areas are clearly marked with signs. Q1: What is the new law for pedestrians? Q2: Why are cyclists included with cars in this law? Q3: Why did the province make this change? This new law is intended to make roads safer for school children, pedestrians and school crossing guards. Pedestrians, school children and school crossing guards are among the most vulnerable road users. The new law responds to recommendations related to pedestrian safety in the Chief Coroner’s Report on Pedestrian Deaths released in 2012 and also to numerous requests from municipalities and safety organizations. Q4: Where does the new law apply? Not apply? 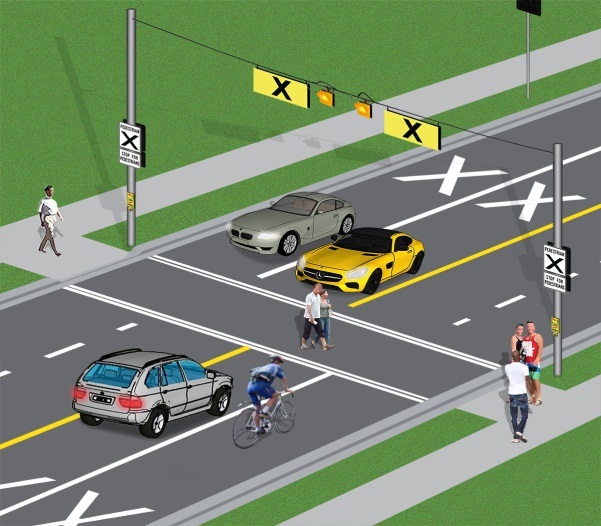 Q5: What is the difference between a pedestrian crossover and a crosswalk? 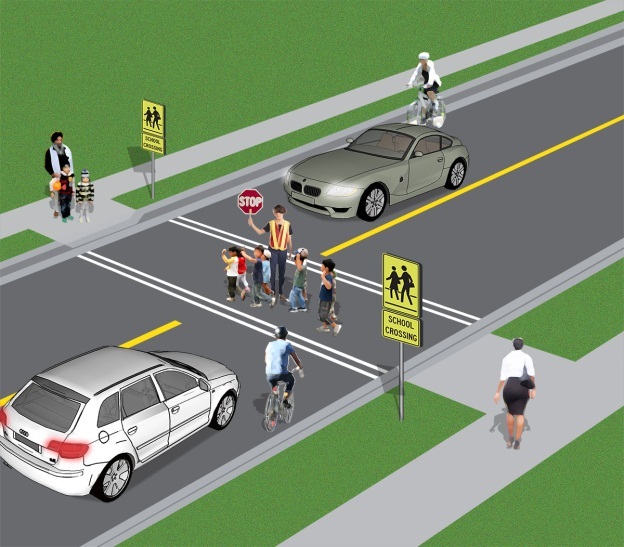 The new law applies at all pedestrian crossovers, not at crosswalks, unless a school crossing guard is present. Pedestrian crossovers are identified by specific signs, pavement markings and lights; some have illuminated overhead lights/warning signs and pedestrian push buttons. Drivers and cyclists must wait until pedestrians have completely crossed the road. 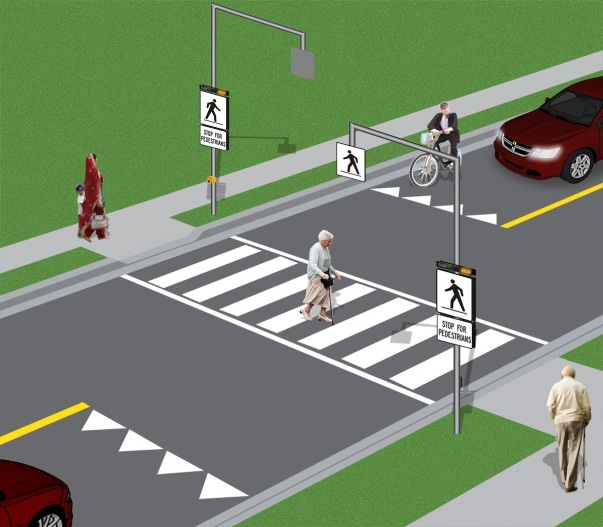 There are 3 new types of pedestrian crossovers (see Q9 below). the portion of a roadway that is indicated for pedestrian crossing by signs, lines or other markings on the surface of the roadway at any location, including an intersection. Q6: What is a school crossing? A school crossing is any pedestrian crossing where a school crossing guard is present and displaying a school crossing stop sign. Q7: Does the law apply province wide? As of January 1, 2016 the new law applies province wide to all pedestrian crossovers, school crossings and other locations where there is a school crossing guard. Q8: What are the penalties? Drivers and cyclists may face a fine in the range of $150-$500 – drivers may also face 3 demerit points. Fines will be doubled in community safety zones. Q9: Are there any new types of crossovers where this law applies? Yes. 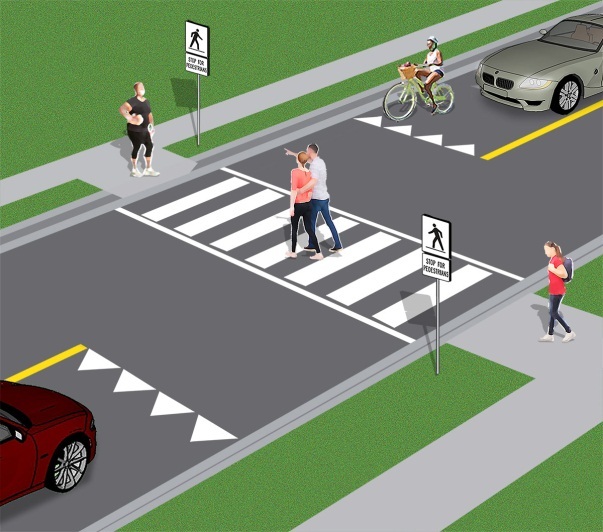 In response to requests from municipalities for more options for pedestrian crossovers, road authorities may choose to install one of the new types of crossovers.The law also applies at these new types of pedestrian crossovers.